Fall is in full swing, and we are taking every opportunity we can to get our fill of pumpkin before Christmas is upon us and we switch over to chocolate and peppermint. The only drawback to fall pumpkin-palooza is that most of the treats, drinks, and pies that use pumpkin are obscenely unhealthy. Even a seemingly innocuous pumpkin spice latte can contain hundreds of calories, most of which come from sugar! 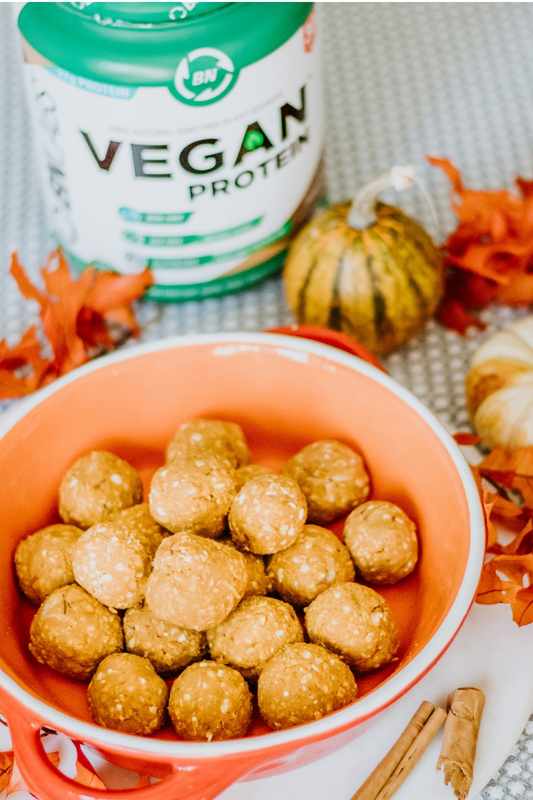 This recipe for pumpkin spice protein balls is a healthy, tasty way to get your pumpkin fix without all the fats, sugar, and artificial ingredients ingredients pumped into many of the shelf-ready pumpkin products out there. It's also portable, vegan, and pairs well with your morning coffee. They are slightly sweet due to the natural stevia in our vanilla Vegan Protein powder, but not overpowering. If you store them in an airtight container, they will keep for about 4-5 days in the fridge. Combine all ingredients into a medium size mixing bowl, and stir gently to combine. You can also knead with your hands to mix a little faster. Separate mixture into 4 equally sized portions. From each portion, create 4 protein balls by rolling the mixture into a ball shape between your palms, using a little bit of pressure to help pack them together tightly. Place your protein balls in the fridge in an airtight container, and allow to set for at least 4 hours, ideally overnight. They are best served slightly chilled or at room temperature.